From the Volcano to the Beach, This YOU-nique Vacation is Full of Romance. Couples who want a Costa Rica romantic getaway while also exploring the country. The green season—from June to November—means you will be greeted with lush vegetation anywhere you look! Afternoon showers are frequent and help you cool off after hot mornings. It’s the perfect time to enjoy a siesta or to re-energize before a spectacular sunset. It’s also a time to pick up a great bargain and that evening rain from your hammock can just make the whole adventure even more romantic. Begin your romantic vacation with a stay in the Central Valley at El Silencio Lodge. This boutique, mountain hotel is a perfect location to share with your significant other. Immerse yourself in the woods and hills around you and go on a cultural experience to the nearby town of Los Bajos. Learn about the local culture, flora, and even master the art of home-made tortillas. The majestic region of Arenal is where you can go on dreamlike hikes under the volcano to see the dried lava and local wildlife. Take a tour to a nearby waterfall to admire the rainforest, or just relax in thermally heated spring water while enjoying a cocktail or two. 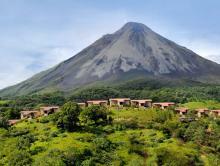 The Arenal Kioro is a cozy hotel with wonderful volcano views just outside of La Fortuna town. Head out for a tour to experience Celeste river, a naturally-colored light blue river. If you want to keep exploring the area, this is the best place to be! 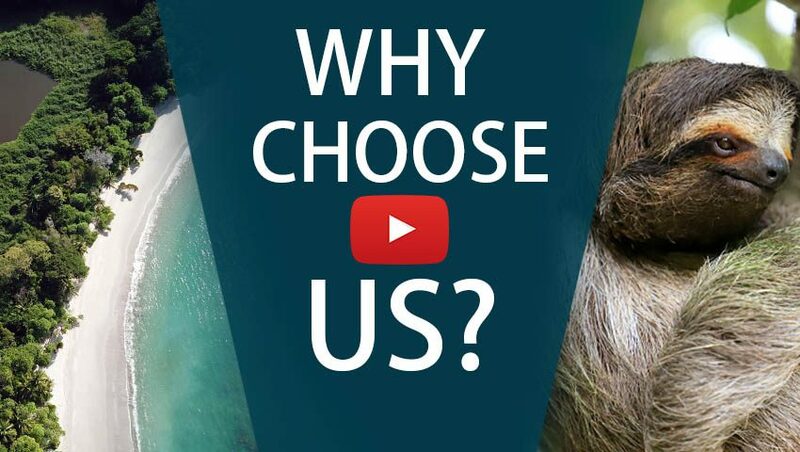 From the wonders of Arenal, go to the beautiful Pacific Ocean and the famous Manuel Antonio, where you will stay in one of the country’s most unique boutique resorts, Si Como No. Here you will enjoy romantic evening strolls along the beach followed by fantastic cuisine. 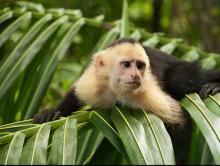 Take advantage of the nearby Manuel Antonio National Park and go on a guided tour to see all its wonders. The beauty of Costa Rica’s nature and its laidback lifestyle make this the perfect place to experience Green Season Romance. What’s included in ‘Green Season Romance’? 2 nights at El Silencio Lodge—Breakfast included. 4 nights at Arenal Kioro—Breakfast included. Private shuttle from San Jose International Airport to El Silencio. Private ground transfer from El Silencio to Arenal Kioro. Round trip to and from La Fortuna waterfall. Round trip to and from Arenal Volcano National Park. Round trip to and from Celeste river. Shared ground transfer from Arenal Kioro to Si Como No. Round trip to and from Manuel Antonio National Park. Private ground transfer from Si Como No to San Jose International Airport. Arenal Volcano National Park hiking tour. Arrive in San José and start your Green Season Romance vacation! Travel via private ground transfer to El Silencio Lodge, a hotel tucked in the outskirts of the Central Valley surrounded by forests and gardens. This area offers a unique perspective of Costa Rican tradition. Visit the nearby town of Los Bajos for a cultural experience, as you visit the local church, school, and learn how to make traditional tortillas from the locals. Visit an orchid enthusiast to admire these exotic flowers and take on a magnifying glass to see a tiny world of wonders. The area around Arenal Volcano, La Fortuna, is known as the Adventure capital of Costa Rica. Here there are many opportunities to relax, experience nature, and get some adrenaline pumping. For a romantic escapade, make sure to book a massage for two at the on-site Neidin Spa, after which you can relax even more at the Titokú hot springs. 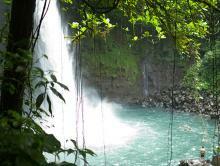 Walk down the steps alongside a canyon into the mountain to discover La Fortuna Waterfall. 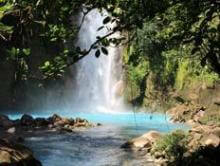 Fed by the Tenorio river, this 210-feet waterfall forms natural water pools at its base. Take a refreshing dip while admiring the lush vegetation and birds all around you. This hike allows you to get close at Costa Rica’s most famous volcano. Arenal has been dormant for several years, but it has left its mark. Hike for 1.6 miles around the forest to spot monkeys, snakes and birds. There are also expansive species of native trees and bushes to admire. In a clear day the dried lava and the volcano’s peak are easy to see, so make sure to bring a camera to take all the photos you can. Rio Celeste National Park is one of Costa Rica’s most unique attractions. Hidden in the northern lowlands of Guanacaste, Celeste river honors its name by being the only naturally light-blue colored river in Costa Rica. Walk up and down the mountain to see the jungle and waterfalls across it. Take a shared ground transfer to Manuel Antonio where you will stay at Si Como No hotel. After a good night’s rest, it’s time to explore the area where the rainforest meets the ocean. 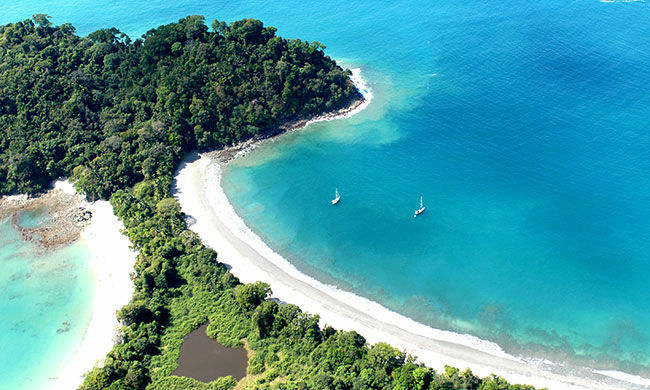 Manuel Antonio is Costa Rica’s smallest national parks, but also one of the lushest and richest. Follow a guide as they point out interesting animals and plants. Enjoy your stay at the gorgeous Si Como No. There are romantic dinners at their first-class restaurant waiting for you, as well as relaxation by the refreshing pool. Take a short walk to the beach to see the sunset, and admire the views from your room. A ground transfer will take you to Liberia Airport where you will catch your flight back home. Explore one of Costa Rica's most beautiful regions in this exciting Arenal Volcano hike. 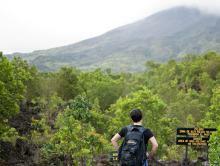 You will follow El Silencio Trail, a tropical path facing the volcano.